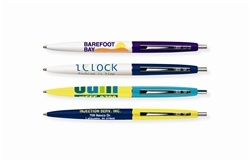 Logo Imprinted Ballpoint comes with click-action mechanism. 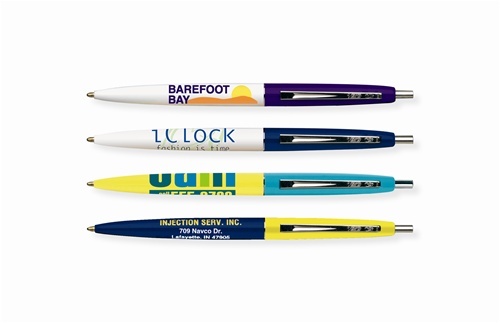 Custom BIC Clic® Ballpoint Pencil is available in 16 colors: Black, Blue, Burgundy, Forest Green, Metallic Dark Blue, Metallic Green, Metallic Orange, Metallic Red, Metallic Silver, Navy, Purple, Red, Royal Blue Ice, Teal, White, and Yellow. New available 6 colors: Berry Crush, Grapetini, Julep, Pink Lemonade, Creamsicle, Electric Punch.